A swim in the ocean is one the most nourishing experiences, for your soul and your skin. It is stimulating, healing and relaxing, but in the winter months it can become a challenge and often comes with a post swim chill. 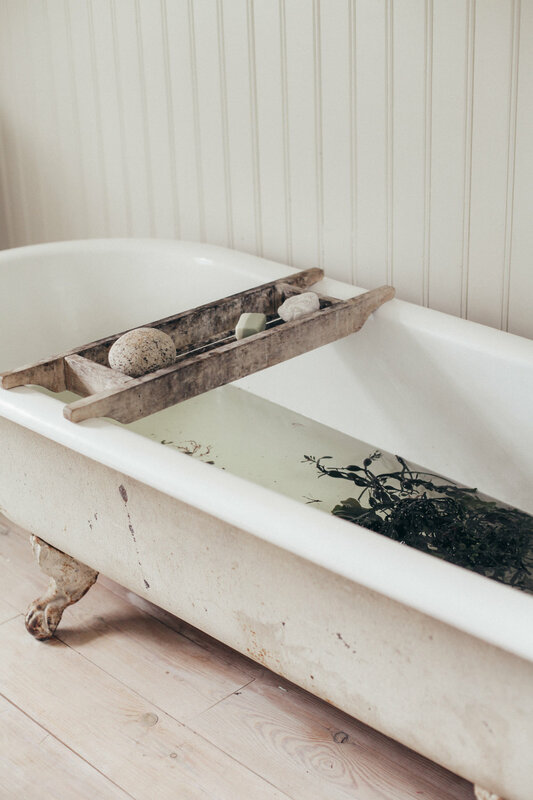 And so The Seaweed Soak has become a staple for us on colder, stormier days, when our bodies crave the minerals of the sea but also the comfort of a steamy bath. It provides you and your skin with all the healing benefits of the ocean, in the ease of your own bath tub. Below is a guide to creating this very unique treat. 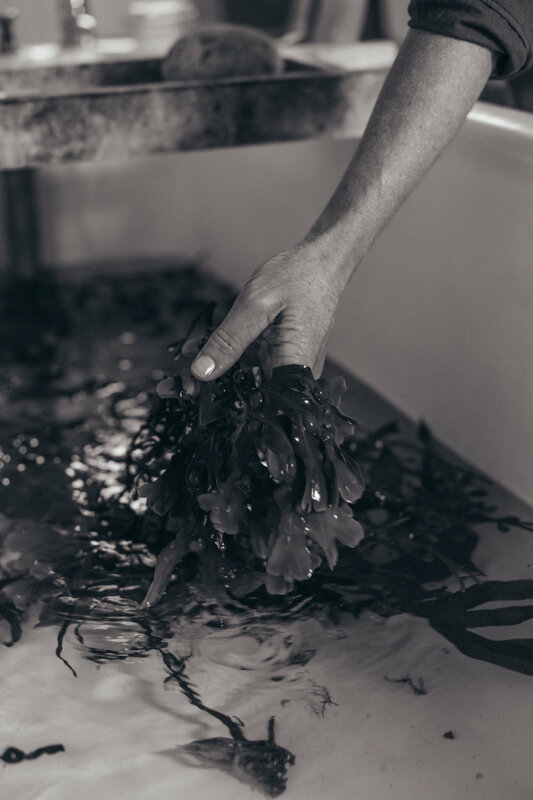 The collection of the seaweed is a delightful and rewarding beginning to this ritual. Walking down towards the coast and along the shoreline in itself will begin to invigorate your soul and senses. With a bag or bucket to fill, comb the waters edge for seaweed, collecting as go. Any type will do, and you will begin to notice native types to the different beaches and the varieties abundant to you. Only collect from clean, unpolluted coastlines. We also encourage you to take home and recycle any bits of plastic or rubbish you might find. Once home, rinse the collected seaweed thoroughly with cold, fresh water. This will remove any sand, grit, debris or dirt. Once cleaned, you can place it in your bath tub. To draw out all of the minerals and salty goodness from the seaweed it must be soaked in boiling water. Seaweed is rich in antioxidants, vitamin A and C, potassium, calcium, magnesium and copper. It has a high iron and iodine content, especially the brown-algae varieties. All these nourishing elements are absorbed by the seaweed from the ocean, and then defused with the boiling water. As it does this, the water will become silky as the oils are released and the aroma of the sea will transport you back to the shoreline. Once the water has turned to a delicious coppery colour, close to the tone of black tea, you can run your bath - the hotter the better! However, if you have sensitive skin, we recommend you leave the seaweed to soak first in the hot water, getting in when the water has cooled. As the bath runs, swill the water around as the goodness defuses. All the silky shapes and earthy colours make for a mesmerising moment. If there are any elements of ritual you like to indulge in, like lighting candles or playing gentle music, go ahead and prepare these too. Now, just soak and indulge. The sensation will be a wondrous blend of a steamy, pampering bath and a revitalising dip in the ocean. Your skin will absorb all the oils and minerals, while your senses are soothed and revitalised. (Optional) After you’ve used your seaweed, we recommend you use it as fertiliser for the garden or allotment. This beautiful ritual was generously shared with us by Julia Bird, a woman with a deep love of sea swimming and the rejuvenating qualities of nature. She has become an inspiration to us, and we are glad to share her wisdom with you.